* The advertised Lease is a rental-purchase agreement for new merchandise. Unless you exercise your Early Purchase Option, to acquire the merchandise you must make 52 weekly payments of $3.00 (plus tax & delivery), for a $156.00 (plus tax & delivery) Total Cost/Total of Payments. This includes a $94.99 Cash Price3 and a $61.01 Cost of Rental. 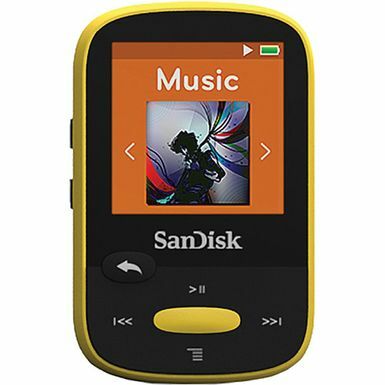 Clip, listen, and hit the gym with the yellow SanDisk 8GB Clip Sport MP3 Player. This lightweight MP3 player features 8GB of flash memory and a microSDHC card slot that supports memory expansion. The player has a convenient clip that's designed to keep the device secure - even if you're working out. Just clip it to your clothing or wristband, and hit the gym or head out for a jog. The Clip Sport is also equipped with a 1.44" color LCD screen that makes it easy to navigate the intuitive user interface. You can quickly choose songs sorted by title, artist, or album.